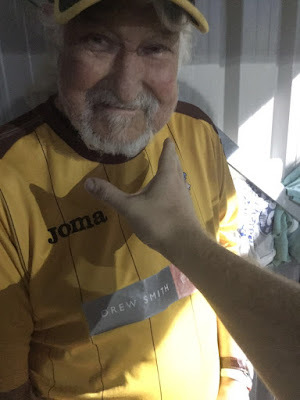 I sadly did not make the game against Wrexham as I had a much needed rest, particularly after the events of Gateshead, but I kindly thanked JR for his offer of a lift. I then read he had decided to take the trip to Wales with Gandermonium….ok lads whatever you do, do not lose JR! On Sunday I spent the day in the company of my sister watching films including the classic Willy Wonka and the Chocolate Factory – the original not the Johnny Depp rubbish! One day I will be bringing my sister and future niece or nephew down to a game at GGL. I haven't decided if they'll be fortunate enough to meet the rest of the, er, people who are involved in this publication or not yet. We finally solve the 'Derek wandering issue'. Nevertheless, I was keeping my eye on the score via the usual means of modern communication – Twitter and Sky Sports Soccer Saturday. All I could read on Twitter is that we were dominating the game and should have been more than one goal up….but hey this is football and the classic cliché of taking your chances comes into play. Yep, you guessed it Wrexham have once chance and score thus taking all three points. So that’s two games in a row losing 1-0 – lets not hope for a third in a row tonight against Braintree. I would like to quote an old line manager of mine, who may I add is a Welling United season ticket holder, Mr Carl Millar for his information via the work’s communicator (think of when you readers may have used the old MSN) on today’s opponents Braintree. I quote from him "They [Braintree] should be easy pickings as they have got a few ex-Welling players and they are rubbish" and "they have got Jamie Day in charge". I also promised him this next sentence and I would like to take this opportunity by thanking Mr Millar for getting me into non-league football. When I joined his team back in the summer of 2011 he asked me "Who's your football team" I replied with "Chelsea" and he asked "No who'ss your local non-league side" and I said "Well I used to live a stone’s throw from Sutton United" he then proceeded to tell me I should go down to GGL to watch a game and I have not looked back ever since…..so thank you squire! Yes he does read my blogs. I also note from Wikipedia that Braintree’s keeper is a Sam Beasant – son of the former Chelsea keeper Dave. I decided to drive down to the game tonight and it takes me a good five to ten minutes to find an actual parking space….it only happens to be the exact same space I used for the Torquay United game, sadly not in my previous manor of Frederick Road but on the less classy Hilldale Road. I walk into the bar and see a number of orange shirts, they must be the Essex boys. I spot Beckwith, Mark and Chip who are talking to "Millwall Terry". Apparently on the grapevine their boy, Dean will not be playing tonight via his father but I decide to wait till the team line up is posted to see for certain. With the line-up picture now in tow on my phone, I decide to head out to the ground and sincerely hope for a cooler temperature outside as the players bar is like an oven. How disappointing it’s still warm – if you are a scoliosis sufferer you will understand why I prefer cooler temperatures. Tonight is also a Champions League night and I have offered Natalie the lending of my phone so that she can watch the Arsenal game against PSG as I have the BT Sport application. So let me just say before kick-off I have 1.3 gigabytes of data remaining which refreshes on the 25th of this month. The opening of the first half see The U’s dominate the possession and the play….and it seems a déjà vu thinking of the recent games against Gateshead and Wrexham respectively. And this is what almost happens as a Braintree cross is met and blazed over Worner’s cross bar. This should have got The U’s into the temperament of getting that first goal and see what happens from there – a run from Stearny sees him fouled, step forward Nicky Bailey for the resulting free kick which was too high to be on target. With ten minutes before half time a throw in sees Amankwaah head into the box and is fouled – penalty to Sutton. Up steps Bailey to coolly slot the ball home and its 1-0 to Sutton – what a shame Bailey is not listed as a striker hey for all fellow syndicate holders. Let’s keep this lead till half time and press on from there. A nasty collision between the Braintree keeper and defender with subsequent medical treatment brought up four minutes of injury time. You know what’s coming – as The U’s fail to clear the lines Cheek is on to a through ball and is brought down by Worner – only a booking but penalty to Braintree…..which is scored so at half time its 1-1. Heading out for the second half, there is no 50/50 number to check as tonight it was the golden goal, which may I add I did not have the correct time. Natalie and I decided to take our places for the second half with the Beckwith family including an obviously non-playing Dean. Now I know one is going to be accused of name dropping yet again, but hey go figure; whilst I am at it I would also like to name drop to say that Sir Elton John appears in my family tree….FACT!!! I decide to make up for naming the giraffe as Dean (yes he also reads my blogs) in my previous write up by having a picture with the real Dean Beckwith. My apologies Dean. It was The U’s who came out for the second half with a point to prove – to get the next goal and make up for the lack of concentration at the end of the first half. A deep Wishart cross was headed on by Amankwaah only for Gomis to have a free header which is turned over the bar by Beasant. An injury to the assistant referee on 61 minutes saw The U’s make a double substitution in bringing Deacon and Biamou on for Hudson-Odoi and Gomis. The latter substitution bringing a shock to Chip as he'd put a bet on Gomis to score at any time tonight – but it seems it's not all bad news on that front! "I can still cash out on Gomis….81 pence" and being the canny gambler, he does exactly that! Still it’s slightly better than what I did once cashing out on Justin Rose for three pence during The Open one year. Burge comes on for Eastmond on 72 minutes and his fresh legs bring a bit more spark to the attack. As the game is nearing its end I am handed back my phone by Natalie, who says "Erm, Keith, I think you've got a few messages from Vodafone". You guessed it, not only have I finished all my data, but I've charged another £13 for extra data usage! I tell her not to worry as it was me who said she could use my phone, so it’s a phone call to Vodafone the next day to get emergency data for the next 12 days before the refresh. Seems I am just too nice, as Chip quoted earlier. Anyways, moving back to the game it’s looking like a point but with five minutes to Burge found himself clear and is dragged back by the last defender. Red card for him then! Up steps JC for the free kick which sails sadly just over the bar. Come on U’s we can get this winner! As the game approaches the 90th minute, another chance for Burge to score the winner is denied by Beasant and up pops the additional time to be added – six minutes, wow, plenty of time to get that goal. However, said winner does not come for us U’s, but for Braintree. On the break their midfielder takes a poke from 25 yards out which from the view I had flew like an arrow into the top left corner…..2-1. What a sickener! What’s worse with no real chance to note of for the final few minutes the full time whistle blows and the visitors secure their first away win of the season and for The U’s and Dos it’s a third defeat in a row. An oddly low crowd of 922 were in attendance, the majority of which will go home disappointed. Also, most important of all, bang goes yours truly’s undefeated record of blog writing duties!! In the bar it’s a very sombre atmosphere and it’s a bitter pint to drink from the result as some of the locals who've stayed take to watching David Weir in the Paralympics – needless to say he has a bad night too as he finishes fourth, the worst position to finish as your just outside the medals. Home time now methinks and Natalie kindly offers me a lift back to my car, hey I know it’s only a 30 second walk but I am tired, achey and very ratty – which is a feeling I most probably will have going forward for the next few days. Thank you Natalie! I would like to now formally hand you over to Totts for what promises to be a real great day and show case for Sutton as the BT Sport cameras are in town to record our home game against Tranmere Rovers. You know, the ones who were once League Cup runners up to the current English champions Leicester City (How those two paths have diverged!). So no phone will be needed to watch BT Sport that day, meaning my emergency data quota is safe! It's also Totts’ birthday game so hope it’s a win for him eh?